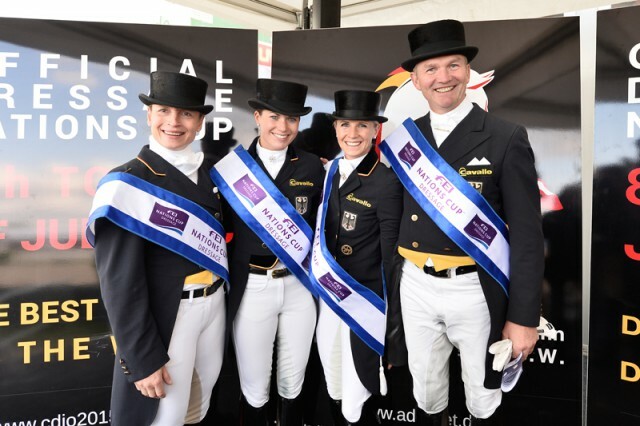 Team Germany were in a league of their own when winning the fourth leg of the FEI Nations Cup™ Dressage 2015 pilot series on home soil in Hagen today. With three scores in excess of 70 per cent and a massive 81.160 for last-line rider, Kristina Broring-Sprehe with Desperados FRH, they finished more than 15 points ahead of their nearest challengers from Denmark, while Spain slotted into third. A total of eight nations lined out for this highly-competitive leg that gave Chefs d’Equipe a chance to test horse-and-rider combinations, and team spirit, ahead of next month’s all-important FEI European Championships in Aachen (GER). Russia lined up a close fourth ahead of Switzerland in fifth while the defending series champions from The Netherlands slotted into sixth ahead of the USA in seventh and Great Britain in eighth and last place. Organisers have a choice of formats to decide the results in this pilot series, and Hagen chose to run the FEI Nations Cup™ Dressage over just a single competition, todays’ Grand Prix. First out for the German side, Hubertus Schmidt had an uncomfortable time when he and his 12-year-old stallion, Imperio 3, had to endure a heavy downpour as well as gusty winds. However they still managed to post a hefty 72.5 which, when it turned out to be the team discard, gave a strong indication of German superiority on the day. German Chef d’Equipe, Klaus Roeser, fielded a truly heavyweight side, and when Jessica von Bredow-Werndl and Unee BB scored 76.680 and Isabell Werth followed that with 77.440 from Don Johnson they already looked unbeatable. Many of the team managers kept their very best until last, and Broring-Sprehe’s big score with Desperados saw all five members of the Ground Jury – Germany’s Katrina Wuest and Evi Eisenhardt, Italy’s Vincenzo Truppa, Sweden’s Gustav Svalling and The Netherlands‘ Ghislain Fouarge – in complete agreement about the individual leading score of the day. She wasn’t the only one to produce a defining last-to-go performance however. The 76.000 awarded to Anna Kasprzak and Donnperignon saw Denmark leap-frog other nations to earn runner-up position. Agnete Kirk Thinggaard’s 67.66 with JoJo AZ was the discard when Daniel Bachmann Andersen and Blue Horse Loxana posted 71.900 and then Mikala Muenter Gundersen and My Lady posted 71.720 for a team total of 219.620. And Beatriz Ferrer-Salat did likewise for Spain. The multi-medalled 49-year-old who claimed team silver and individual bronze at the Athens 2004 Olympic Games steered the 14-year-old Delgado to a score of 75.180 which, when added to the 69.980 from Claudio Castilla Ruis (Alcaide) and 71.620 from Jose Daniel Martin Dockx (Grandioso) gave a team total 215.780 – Jordi Domingo Coll’s 68.78 (Wonder) was the discard here. Team Russia’s 213.500 left them just over two points adrift in fourth place, and again the anchor partnership proved pivotal. Inessa Merkulova and Mister X are a hugely popular partnership wherever they go, and they lived up to their usual billing when boosting Russian chances considerably with a mark of 75.340. Switzerland finished fifth on 211.040, the three-member Dutch team finished sixth on 210.360, the USA lined up seventh with 210.000 and Great Britain rounded up the scoreboard with their total of 205.840. The individual scoresheet told the full story at the end of the day, with Germany’s Broring-Sprehe, Werth and von Bredow-Werndl filling the top three places ahead of Kaskprazak, Merkulova and Ferrer-Salat. Broring-Sprehe had every reason to be in buoyant mood, as she was married just over two weeks ago to long-time boyfriend Christian Broring in a civil ceremony. They plan a church wedding following the FEI European Championships 2015 in Aachen, and the 28-year-old German Dressage star certainly pleased her Chef d’Equipe today with her sparkling ride in difficult circumstances. “Kristina was very, very good even though her horse got quite excited due to the weather”, Klaus Roeser said, “and Isabell was very good. Hubertus was a bit unlucky. There was very heavy wind and rain as he started, and he coped really well so his horse could show his quality, but they both had an early shower! All four riders did a great job!”, he added. Roeser has many of his big guns competing at Hagen this week and said today’s competition gave him the opportunity to see some potential team members for the forthcoming Championships. “But on the other hand we also have other interesting horses and riders going in the other Tour here. We have more days of competition, and by Sunday we will have a better overview of our potential team situation” he explained. He talked about his team’s winning margin. “We came with a strong team, but everyone faced the same conditions today and everyone had the same job to do. Yes the distance between ourselves and the Danes was not too small – but from our side that wasn’t a problem at all!” he said with a laugh. Desperados FRH (Kristina Broring-Sprehe) 81.160. Mister X (Inessa Merkulova) 75.340. Smeyers Molberg (Marcela Krinke-Susmelj) 71.760. Bonzanjo (Diedeick van Silfhout) 71.900. Die Callas (Anna Louise Ross) 69.200. Das Silberne Pferd 2015: Und das sind die Nominierten!